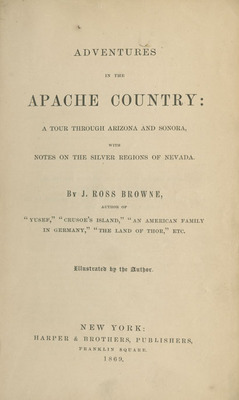 Browne, J. Ross , “Adventures in the Apache Country: A Tour Through Arizona and Sonora with Notes on the Silver Regions of Nevada ,” Arizona 100: Essential Books for the Centennial, accessed April 21, 2019, http://speccoll.library.arizona.edu/online-exhibits-dynamic/az100/items/show/173. 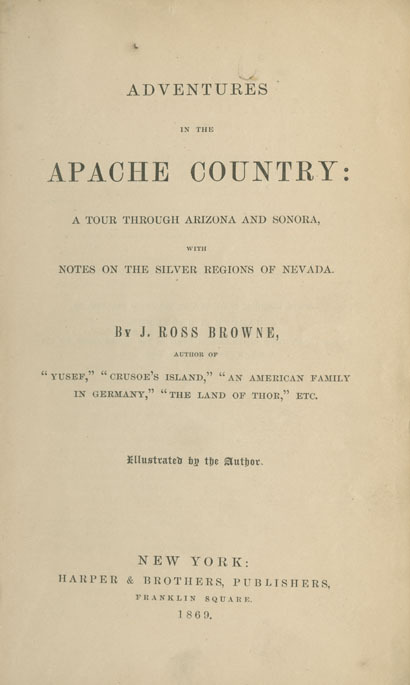 An inveterate traveler, the Irish-born Browne (1821-1875) toured southern Arizona in 1863, with his friend Charles Poston, as part of a private inspection of mines and mineral resources. 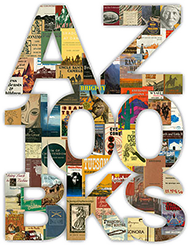 His report entitled “A Tour Through Arizona,” which appeared in six installments in Harper’s New Monthly Magazine between October 1864 and March 1865, provides one of the earliest and most detailed descriptions of the history, people, and prospects of the territory. The dozens of drawings interspersed throughout the text represent rare early depictions of mines, missions, towns, and villages, along with humorously evocative images of Anglo and native inhabitants. New York : Harper & Brothers, 1869. 535 p. : ill. ; 20 cm.